Investment growth and SOEs would be economic engines again, a repeat of 2009? 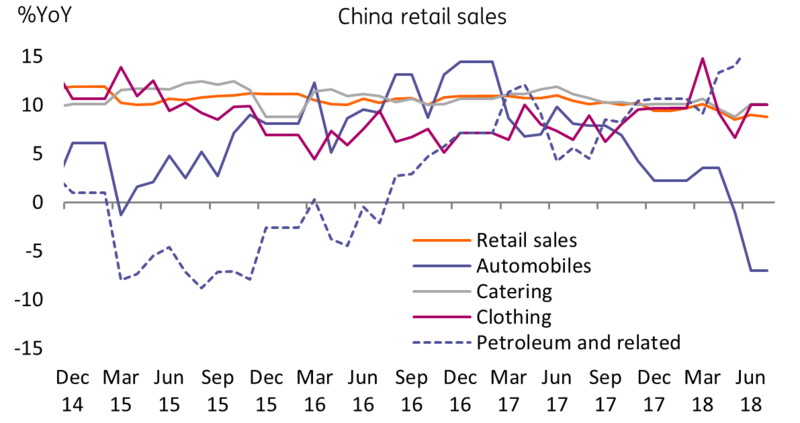 China's overall economic performance in terms of GDP depends on whether fiscal stimulus and monetary easing are big enough and happening fast enough to offset the negative impact on exports and related manufacturing activity from the ongoing trade war. As the Chinese government has put substantial stimulus and easing in place, the Chinese economy should not experience a deep contraction. Nonetheless, we are still revising China’s GDP downwards to 6.6% in 2018 from 6.7%. We expect 3Q and 4Q GDP to slow to 6.5% year-on-year and 6.3% YoY respectively from 6.7% in 1H18. This steeper slowdown in 4Q reflects our expectation of 25% tariffs on $200 billion of exported goods to the US becoming effective. We retain our end-of-year USDCNY forecast of 7.0. 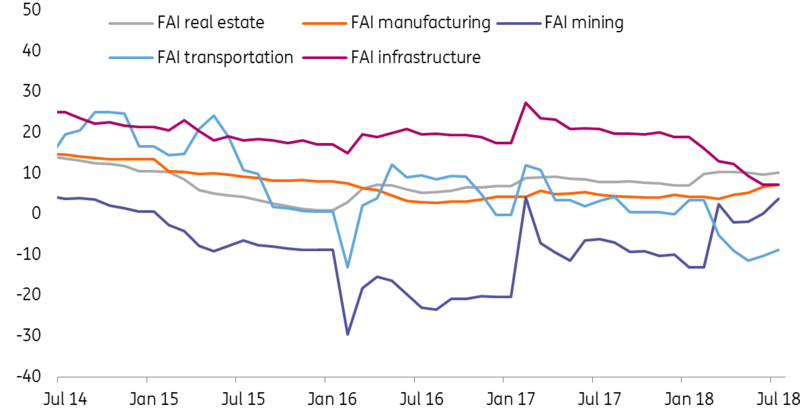 Fixed asset investment slowed sharply to 5.5% YoY in July from 6.0% YoY in June; mainly as a result of negative 8.7% YoY growth in transportation, caused by limited local government spending. Real estate could stay strong because in a trade war, the economy still needs investment growth, even if the government previously indicated that tightening measures were needed. Industrial production growth stayed flat at 6.0% YoY in July, of which industrial robot growth slowed to 6.3% YoY in July. The steep slowdown of robot production growth started in June, where 7.2% YoY was registered, down from May's 35.1% YoY. 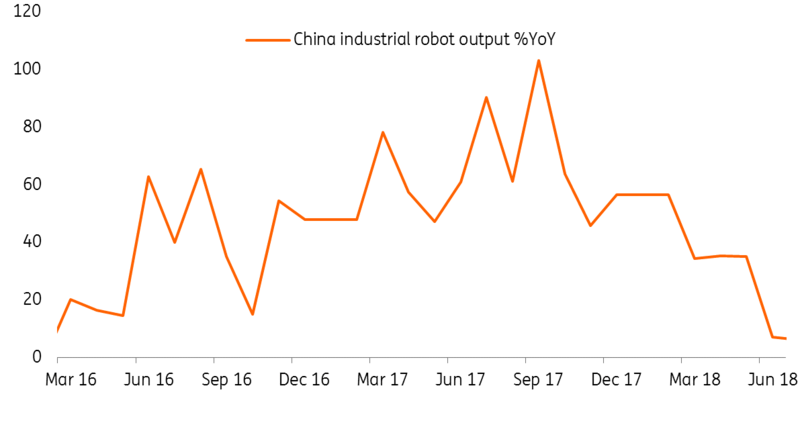 It seems that the trade war has deferred robot production, as exporters and manufacturers expect lower production order volumes. Retail sales growth also slowed to 8.8% YoY in July from 9.0% in June due to negative sales growth in automobiles. Tariff cuts on imported automobiles (except for those from the US) may not have yet fed through to existing inventories at retail outlets, and until this clears, a mismatch in price expectations between consumers and sellers may weigh on car sales. Headline aggregate financing figures show that credit growth shrank in July to CNY1040 billion from CNY1180 billion from the previous month. One interpretation is that the easing of monetary policy has not been effective in boosting the economy. But there is a more positive interpretation. Shadow banking activities continued to shrink in July, which could be a result of sustained tight asset management policies despite some relaxation. This should free up some bank capital for on-balance sheet loan growth. Written-off loans, a new statistic in aggregate financing, were also large, in 1H, providing some room for future loan growth. The bank and insurance regulator reported that infrastructure loans rose by CNY46.9 billion to CNY172.4 billion in July. This indicates that infrastructure activity should rise at a faster speed in coming months given the direction from the State Council. SME loans can be rolled over without repaying any principal. We expect two 50 basis point cuts in the targeted required reserve ratio (RRR) in 2H18 to further ease liquidity for SMEs. Moreover, interest rates have fallen a lot since the end of June. 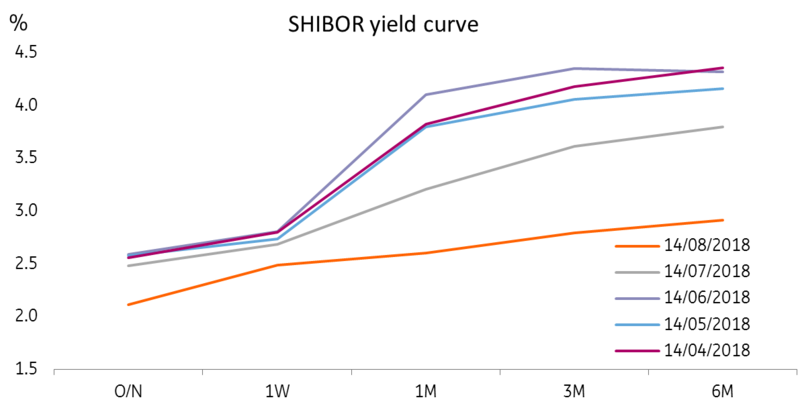 The current level of interest rates (SHIBOR 7D at 2.4910% and 3M at 2.7910%) is low enough for corporates to rollover debt or make new loans. Additional loans to boost infrastructure and support SMEs will provide some cushioning against a trade war. Though as we noted earlier, the net effect on growth is still modestly negative. July's State Council meeting has already reinstated infrastructure investments to cushion the economy from the trade war. The slow investment growth in July should not be considered as representative of the rest of 2018. Despite their inefficiency, infrastructure projects could still create overcapacity again in a few years time, similar to the experience following the 2009 stimulus. We believe that the government is going in this direction to keep growth stable. It will not only push forward planned investments but also put up new investment projects to prepare for a long drawn-out trade war. 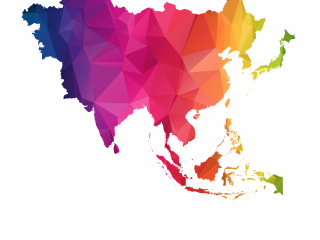 SMEs are vulnerable to tariff barriers; the central bank has already announced that SMEs could have loans rolled-over even without repaying principal amounts. State-owned enterprises with more investment projects and manufacturing activity will show their "social responsibility" by absorbing labour from SMEs. This will stabilise labour markets, but wage growth will likely fall in export-related sectors unless tax cuts for corporates or tax holidays for exporters are announced. We are uncertain if consumption will slow. Though export sector wage growth may slow, new sector wage growth could offset this. We expect the government will maintain consumption levels if necessary by delivering consumption-friendly policies, e.g. salary tax cuts. Though the government has not announced the full amount of stimulus planned, the State Council’s 23rd July announcement of CNY2628 billion, is still not comparable to the CNY4 trillion stimulus in 2008-2009. 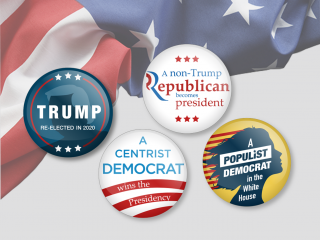 We expect more to come as this is just the start of the trade war and consequently, just the beginning of fiscal stimulus and easing.